Jelly jar labels can adhere to any container and have any information you want - custom logos, product information or even a company mission statement. Thanks to the experienced team of printing professionals at Lightning Labels, these labels at 100% customizable to meet your needs. You can order labels in all shapes, sizes, quantities and colors, and they can be used by businesses or individuals. Small business that want to stand out against larger competitors should know jelly jar labels will give your product an edge. The custom labels are high quality, which means vibrant graphics will not fade away, and labels will not peel off while on the shelf. Labels for jelly jars can attract more attention for your product: Don't let your unique product get lost on the shelf! Custom labels can bring your ideas to life. Small companies with fewer resources can get high-quality labels without stretching their budgets or settling for less. Eye-catching packaging is sure to help you increase sales. Whether you are looking to sell jelly in a store or at a farmer's market, Lightning Labels will create an amazing label to bring your ideas to life. Call Lightning Labels to Design Custom Jelly Jar Labels Today! 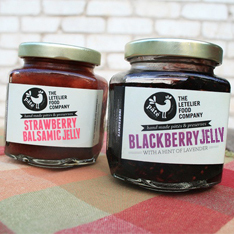 Call us at 888-907-3004 today to place your custom jelly jar label order and watch sales skyrocket!